Welcome to my Christmas News New Forest. There's lots for me to share with you and recommend too. Where to buy beautiful New Forest gifts, where to stay (and your dog can come too), where to have fun and explore this beautiful National Park too. You may be looking for some Christmas "bling" in my photos but I decided to keep it more natural this year and more relevant to the New Forest. For my New Forest Christmas gifts and present ideas here are a few I've tried and tested - sometimes often! This is a fantstic place to really get to the heart of understanding the history and culture of the New Forest. This is your chance to get free entry to the museum, have some fun, make some crafts, and enjoy activities. You can also have a seasonal mince pie and a glass of punch if you are old enough to buy one! Paddle to meet Father Christmas at the New Forest Activities Centre, Beaulieu on Saturday, December 12 from 11am to 12.30pm and December 19 from 2pm to 3.30pm. The Christmas Paddle adventure includes a 90-minute canoe trip on the Beaulieu River, meeting Father Christmas, a gift for anyone under 16 , hot drinks and mince pies on arrival. To book contact the New Forest Activities Booking Centre in Beaulieu on 01590 612377. Update: I've spent a lot of time trawling through hotels I've visited in the past and found fine. Today I've looked at Tripadvisor for them all and they all seem to have faults + some photos which means my suggestions have been limited. If you use my dog friendly hotels page you can then decide for yourself, which I think is the fairest option for you. Sadly, the hotel I really love the Rhinefield House is already fully booked for their Christmas packages! This hotel is undergoing a revamp and it looks very exciting. The Christmas dog stay package looks really great. They open on 7th December although their Garden Wing is already refurbished. I have stayed here in the past and although I haven't yet visited the revamped hotel it is in a beautiful location, which I hope you'll enjoy. This is a different way to experience the New Forest - this time a coastal experience. Lymington is a beautful part cobbled old town right on the sea front. This hotel is on the High Street and after reading the reviews seems to consistently offer excellent customer service and good food too. I visited it for a pop in meal last year and it is quirky and well positioned. No onsite parking may be a disadvantage for you though. Dogs are allowed in the downstairs rooms and in the conservatory area. This is a chance for little ones to get up close to their favourite farmyard animals all under the warm, dry barn roof! Entrance price includes a visit to father Christmas in his farmhouse grotto and a gift too. The Activity Farm is not open at this time so you'll only be able to visit the barn and its animals. Also it's not bookable. Beaulieu Christmas Events can offer you fun, entertainment and lots of activities all within the beautiful grounds. 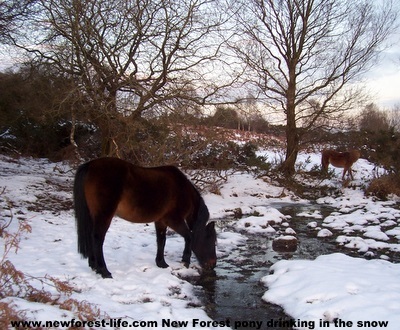 It is one of my favourite New Forest places to visit. It has so much to offer - throughout the year. Check out my Beaulieu Review for year round fun and frolics! Beaulieu Shop and Kitchen Shop has unusual gifts and traditional toys and motoring presents for the men and boys in your life. I've never visited without finding something I know my son would love. You can enter the main shop without entering the main grounds but to use the kitchen shop 9which has beautiful gifts) you do have to pay the entry fee for the day. Both are well worth a visit though. 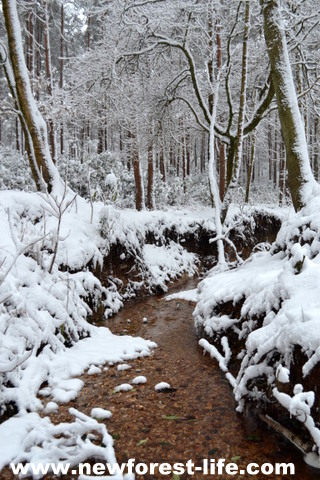 I know this is a typical winter image of an idyllic New Forest scene but I also get worried about the New Forest ponies and other animals at this time of year. Will they find enough to eat? Are they fit enough to endure low winter temperatures. Snow is beautiful but it does have it's downside too for those who can't find a warm fireside to huddle up to. 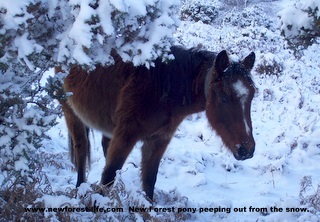 That's why we will be extra vigilant and make sure we see out new Forest pony at least twice a day to check he's happy, warm and well fed. 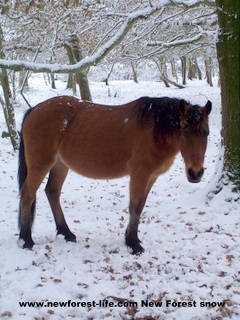 New Forest pony in a hard winter R.I.P. 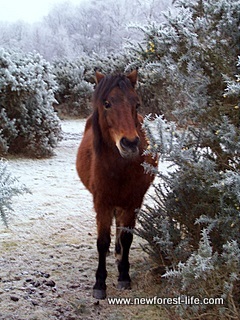 Throughout the New Forest year we go through trauma ans sometimes heartache with our New Forest ponies. Perhaps Christmas is a time to think of them in a special way. I'd like to thank lovely Fudge who has not only had some lovely foals but has so many times been asked to be a surrogate mother during weaning times for our foals over the years. Sadly, despite lots of care and medication from the vet Fudge was lost to us this year. R.I.P. Fudge and thank you.